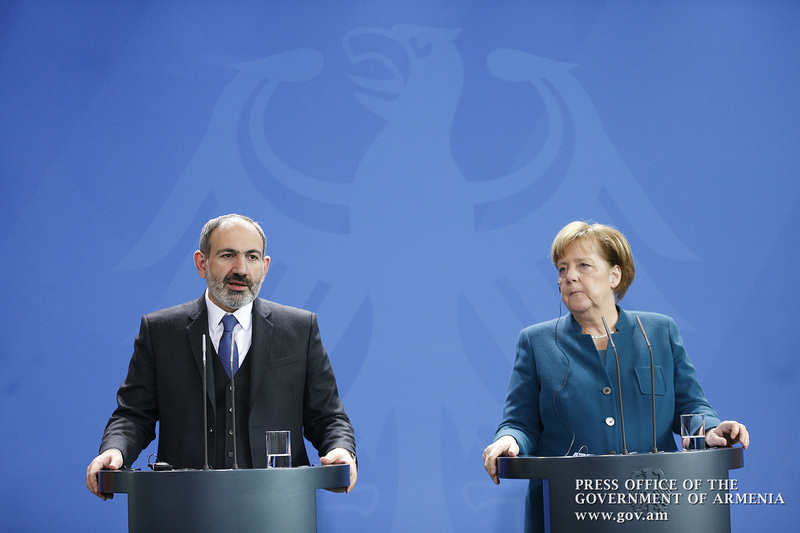 German Chancellor Angela Merkel and Armenian Prime Minister Nikol Pashinyan, who is paying an official visit to Germany, held a joint press conference after their talks and answered journalists’ questions. 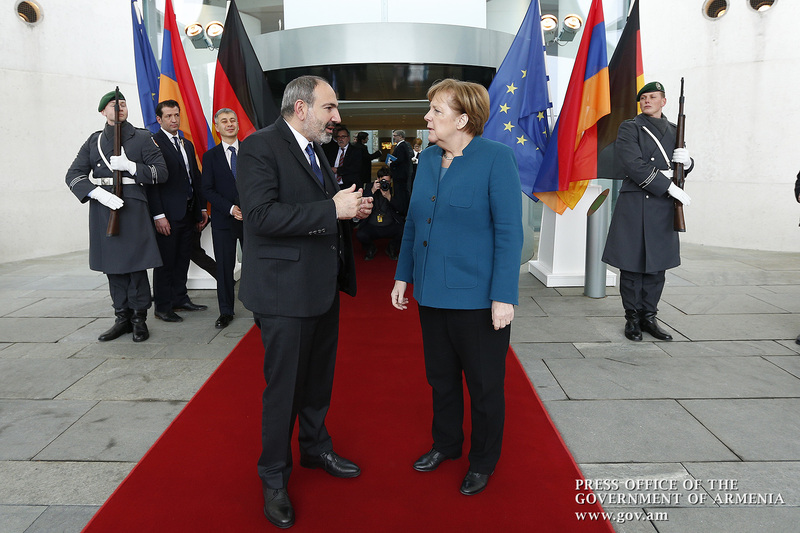 FRG Chancellor Angela Merkel - Dear Mr. Prime Minister Mr. Nikol Pashinyan, I am happy to welcome you to the Federal Republic of Germany. I was glad to visit Armenia last year, during which we saw the moods that dominated your country. Later on parliamentary elections were held, which once again demonstrated that people in Armenia are very hopeful about the new prime minister. In this context, we also discussed how we can develop our bilateral relations to improve the living standards of Armenian citizens. We discussed cooperation programs in different spheres. We decided to develop bilateral relations and encourage democracy. We are happy as were able to put in touch our research centers. Negotiations with the FRG Eastern Economic Commission will take place later today, which will serve as a stimulus for Armenia’s economic development. 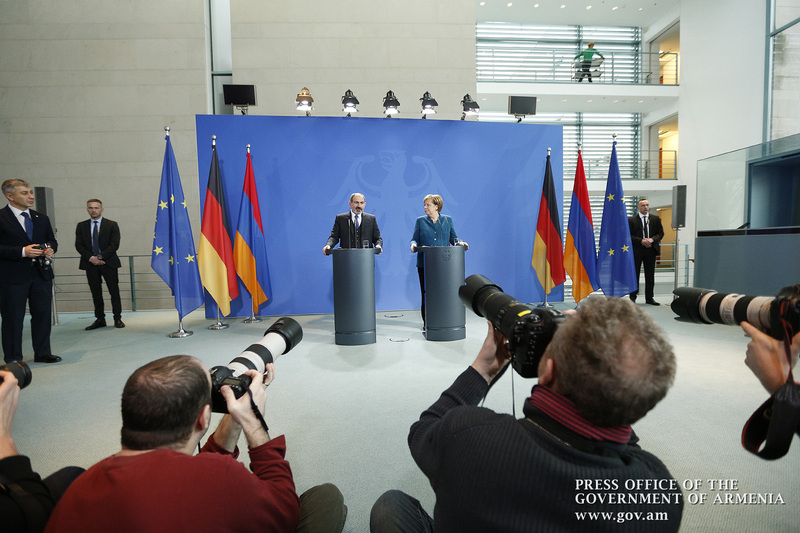 We will have Germany’s economic potential to come to Armenia. Last year our trade turnover increased 40%. I think there are many things to do, and we have the necessary capacity succeed. It is crucial for the Armenian Prime Minister to make quick progress and new achievements that will stop the economic downturn that existed in the past. We have also talked about the Nagorno-Karabakh conflict. As you may know, the two Heads of State have held their first meetings and, of course, both sides need to show goodwill and readiness for compromise. We believe that the peace process should be maintained so that the existing opportunities could be used. RA Prime Minister Nikol Pashinyan - Thank you, Mrs. Chancellor. 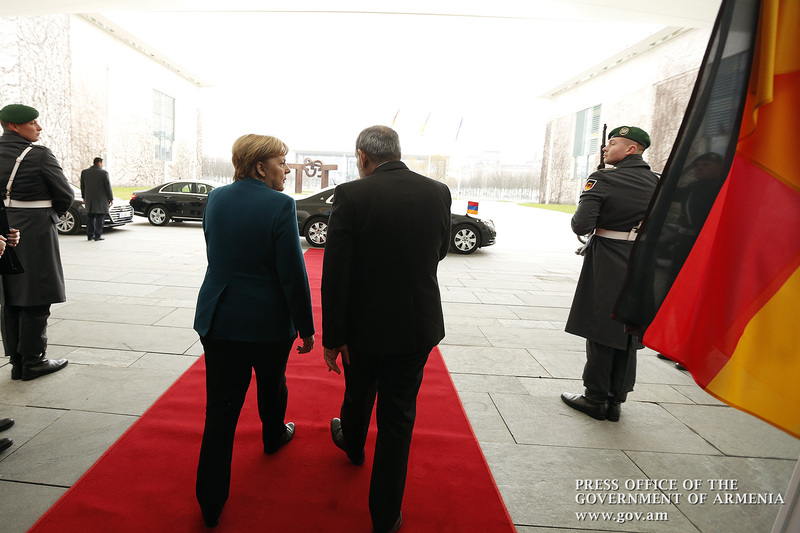 First of all, I would like to thank Chancellor Angela Merkel for the invitation to pay an official visit to Germany. 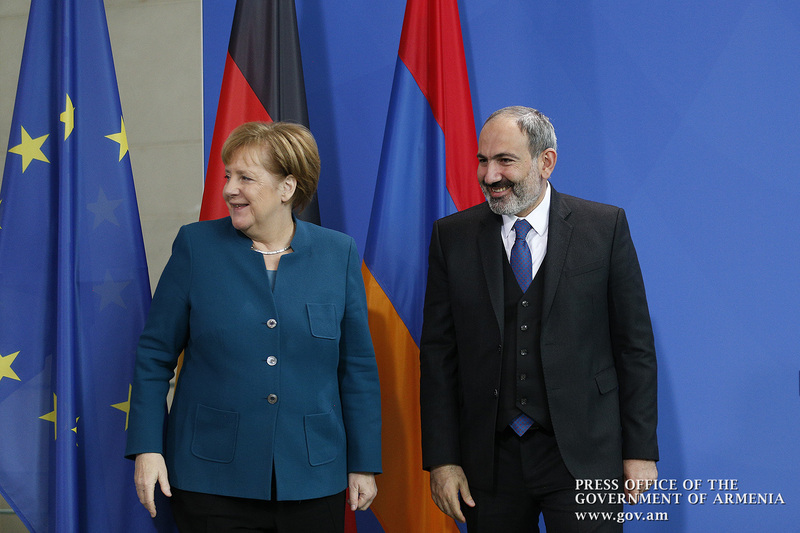 Germany is an important international partner of Armenia, the first trade and economic partner in the European Union, and the second in the world. 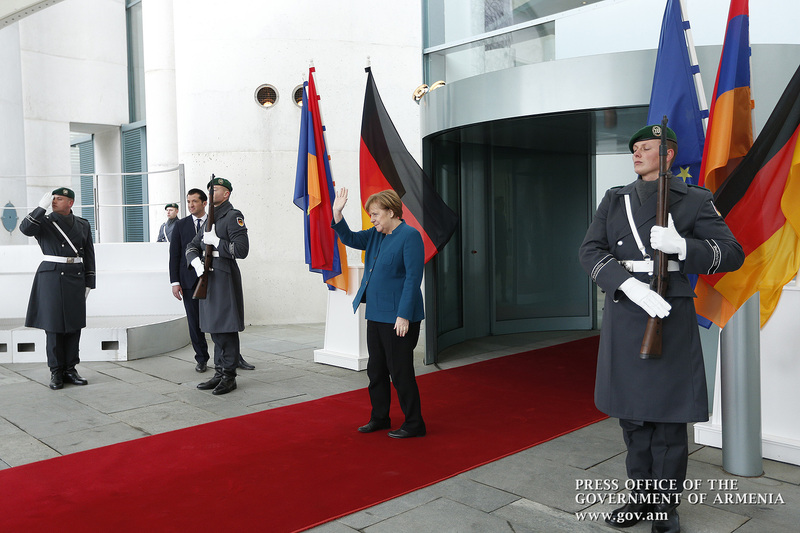 This fact alone reveals the special character of Armenian-German relations. 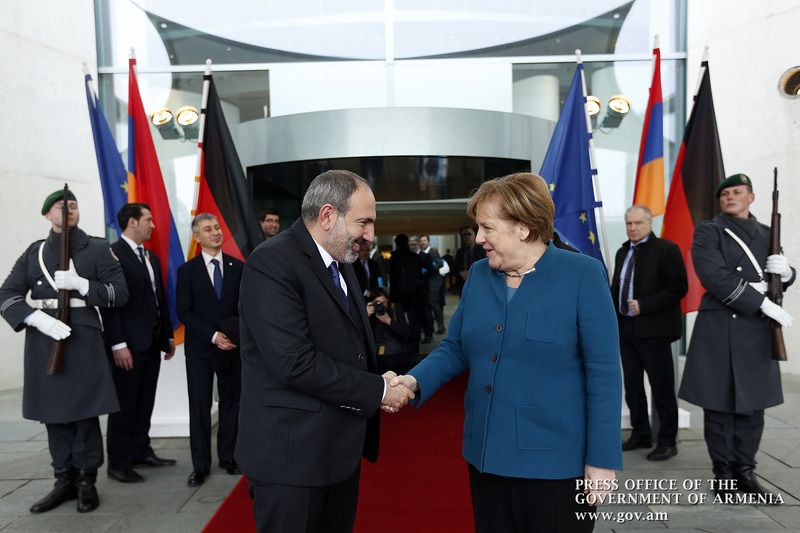 Indeed, now we can say that our relations are developing dynamically, since less than a few months ago the German Chancellor was in Armenia on an official visit, and my counter visit is taking place now. 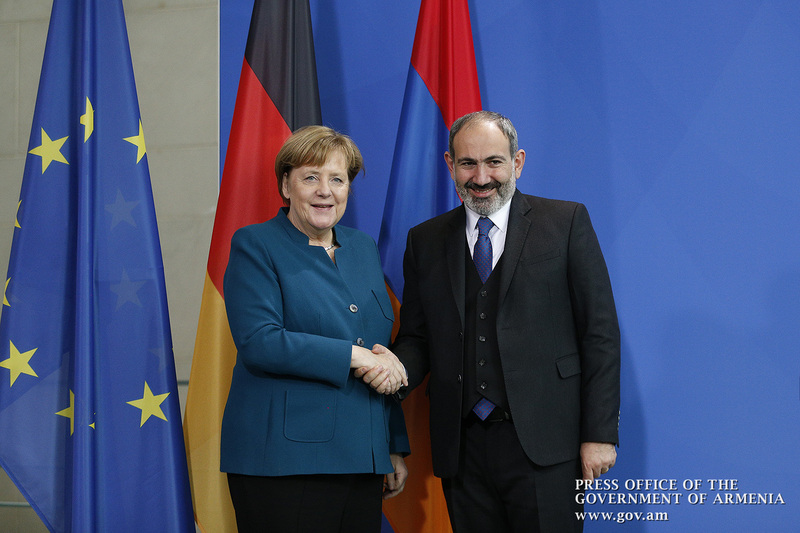 I am happy that in the meantime, important developments have been registered in Armenia to once again demonstrate that democracy and the democratic system are irreversible in our country, and we are glad that both Germany and the EU are fully committed to supporting the Republic of Armenia in the process of democratic reforms. We discussed a wide range of issues relating to bilateral relations. 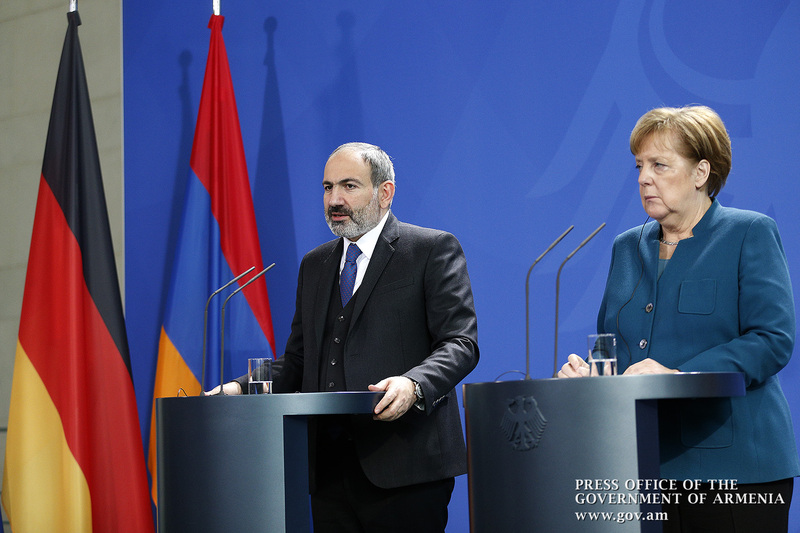 Economic cooperation was of particular importance, and we stated that several major investment projects are being implemented in Armenia mediating German capital. 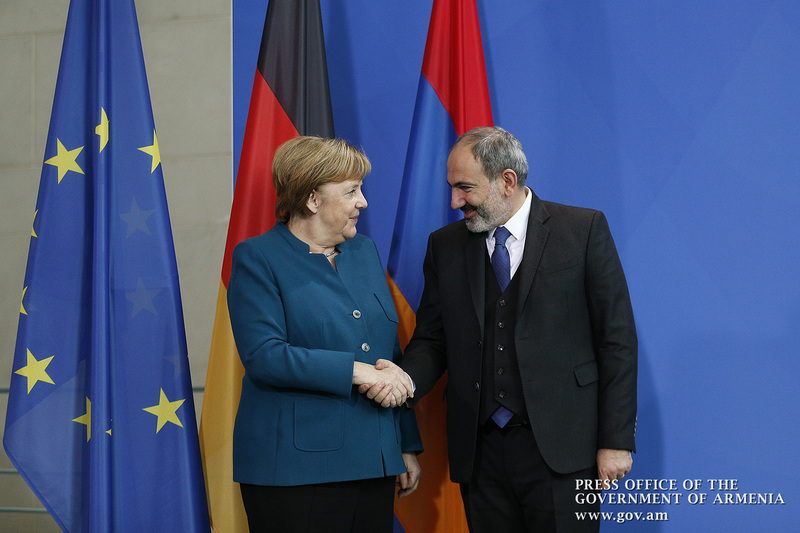 We hope that with the improvement of Armenia’s investment climate, German investments will inevitably grow in our country. In fact, we also talked about the situation in the region, about issues on the international agenda, and I am pleased to state that we have mutual understanding on these issues. Of course, stability and peace are crucial to our region, but it is as much important to state that peace and stability must be the result of multilateral efforts. We also talked about the current situation in the settlement of the Nagorno-Karabakh conflict, and this statement was also made in the context that the process itself should be two-sided as it cannot go unilaterally and be carried out in the logic of one-sidedness. 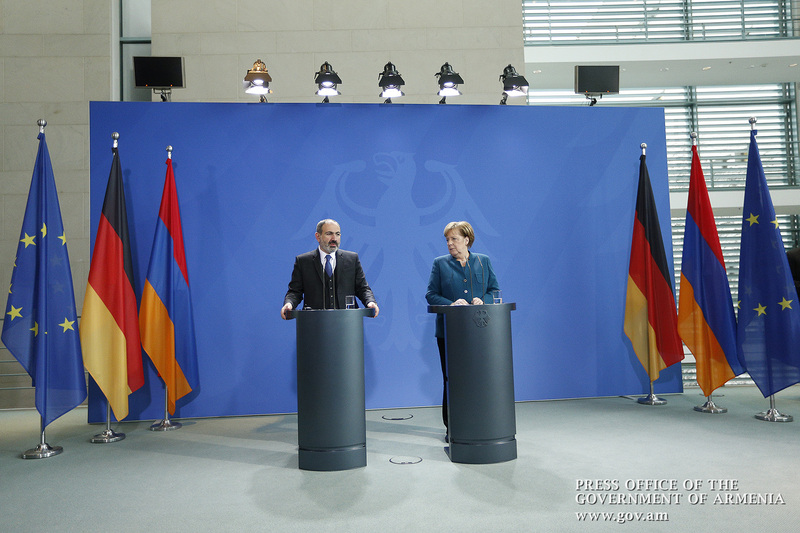 It can be stated that at least for the moment, I am satisfied with the results of our discussions, our negotiations: not only can we see any obstacles whatsoever to the further development of Armenian-German relations, but there seems to be mutual interest to give a new impetus to our relationship, and I am convinced that it will be so. Question - I address my question to Mrs. Chancellor, expecting your response, Mr. Prime Minister. It has to do with the Artsakh issue. 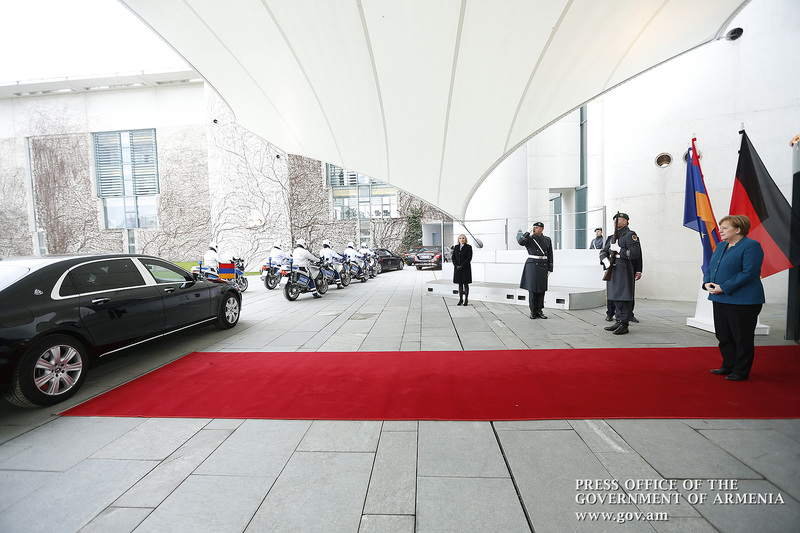 The leaders of Armenia and Azerbaijan have met three times over the past few months. Mrs. Chancellor, how do you think these meetings and the changes that have taken place in Armenia may affect the peace process? What opportunities do you see? Thank you. FRG Chancellor Angela Merkel - I believe it is nice when people talk to each other, but the sides should proceed from words to deeds. I think that the Armenian Premier has taken courageous steps, but it still remains to see if the other side will take such brave steps as well. I think that the Prime Minister should continue along this policy line, though after all, both sides should reach an agreement. 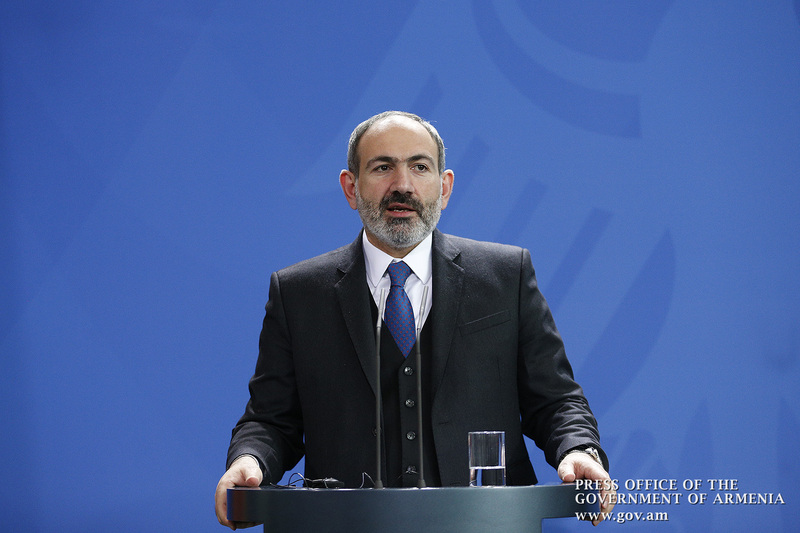 RA Prime Minister Nikol Pashinyan – I would like to comment on the steps mentioned by my counterpart, as they seem to be extremely important in the current situation. As you may know, a few months ago I made a statement in Armenian parliament which I consider very important. I said that any variant of settlement of the Karabakh conflict should be acceptable to the peoples of Armenia, Karabakh and people of Azerbaijan. I hoped that a similar statement would be followed on the part of Azerbaijan, but unfortunately, no Azerbaijani official said even a single word that the settlement ought to be acceptable to the peoples of Armenia and Karabakh. The situation with this statement alone clearly shows the situation in the negotiations. As far as equivalent statements are not being voiced from Azerbaijan, there are no great hopes of progress in the settlement of the conflict. It goes without saying that the Republic of Armenia is committed to exclusively peaceful settlement of the conflict. I wish to put on record that I have clearly stated during our discussions that as the Prime Minister of Armenia, I cannot but negotiate on behalf of the Republic of Armenia, and I cannot negotiate on behalf of Nagorno-Karabakh simply because the people of Karabakh did not participate in Armenia’s elections, and consequently they did not give me their vote of confidence. They have their own president, their parliament and government, who are supposed to negotiate on their behalf as the authorized representatives of the people of Karabakh. Question: Mr. Prime Minister, how do you think the EU can act as a mediator in the Karabakh issue? RA Prime Minister Nikol Pashinyan - As you know, there is an internationally agreed format of the settlement of the Karabakh issue - the OSCE Minsk Group co-chairs and the co-chair countries - France, the United States and Russia. In fact, it is the Minsk Group co-chairs, but the scope of the Minsk Group is much wider so we can state that this format actually represents the representation of the international community in the negotiation process. I think the format of the Minsk Group co-chairing in these years is quite successful in terms of logic in promoting relative stability in the region. As regards the actual settlement, I believe that the co-chairing countries and the international community have made it clear that it is up to the three sides involved in the conflict to resolve it. The international community cannot resolve the conflict for the three sides to the conflict; it can just provide a platform for negotiation. I believe that the OSCE Minsk Group Co-Chairs have succeeded in terms of creating that platform. Question: Mrs. Chancellor, taking into account the recent developments in Armenia and the ongoing anticorruption campaign, as well as the European Union’s approach referred to as “More for More,” will Berlin make new efforts to increase the EU’s assistance to Armenia and facilitate the visa liberalization arrangement? FRG Chancellor Angela Merkel - Yes, that’s it. We are already supporting: the European Union has clearly expressed its support through Mr. Johannes Hahn, and we do not want to interfere in the foreign policy pursued by the Foreign Ministry. As a sovereign nation, Armenia determines on its own which countries it should work with in the field of external relations. We already have a contract through which we can develop our relationships. 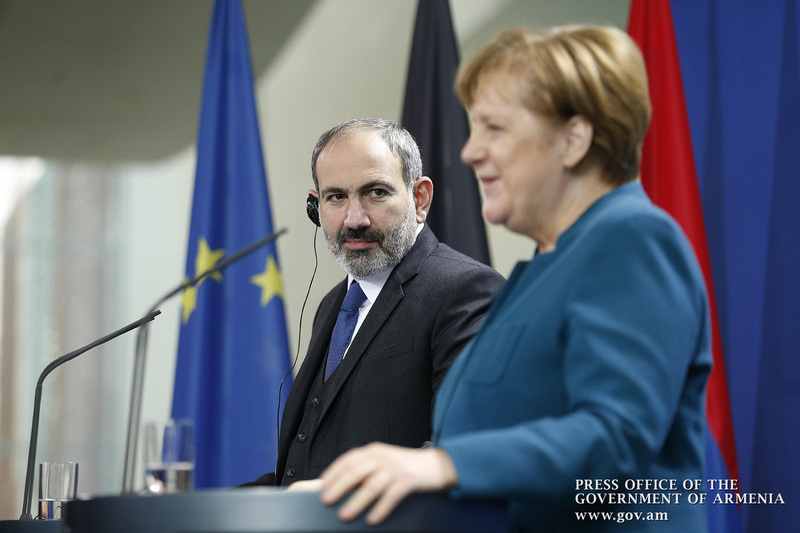 RA Prime Minister Nikol Pashinyan - I think that the latest visit paid by European Commissioner for Enlargement and Neighborhood Policy Johannes Hahn gave a clear answer to that question. The EU representatives have already said they are going to step up the amount of assistance to Armenia, and in this regard, it is obvious that there is a very good atmosphere of partnership in EU-Armenia relations, and I do not think that there will be any impediments here. In fact, drastic democratic transformations are taking place in Armenia, and there is no doubt that they will continue. As I said earlier, the latest elections reflected our people’s choice and the nation’s value system. It is very important that in this sense, we are not facing any geopolitical restrictions in terms of democracy, which means that our developments, our reform agenda will be carried out in a more successful, more favorable environment. In this regard, we maintain direct and open relationship with our partners in the Eurasian Economic Union and in our relations with our EU partners. Therefore, I think that now the Government of Armenia has to serve the ball: we should be able to effectively implement our reform agenda, confident that we will be supported by our partners from both the European Union and the Eurasian Economic Union. Coming to visa liberalization, I should note that we have discussed it, too, and agreed that the Republic of Armenia needs to be a more attractive country for its own citizens. I am glad to state that the number of citizens coming back to Armenia increased in 2018 for the first time over the past decades. We need to carry out institutional reforms in our country, so that Armenia could not be considered as a country of refugees.